Celebrating many years as Gullah Geechee Ring Shouters, now one of the Worlds top Performing Artists of the Geechee Gullah Culture. 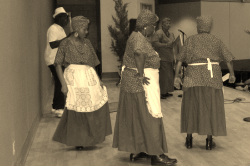 All descendants of African slaves, offering History & Heritage Presentation of African-American Culture from Slavery. Africa to Gullah:South Carolina University brings National exhibits . Featured a performance by the Geechee GullahRing Shouters at the opening event, which also featured U. S. Congressman James Clyburn and world renowned artists Jonathan Green both spoke at the national exhibit. 400 participated in the largest Ring Shout ever recorded! We are please to say and announce, every thing was great in WASHINGTON DC *Smithsonian (Word, Shout, Song: Lorenzo Dow Turner) We (The Geechee Gullah Ring Shouters of Georgia) We were so happy to close out the exhibition at the Smithsonian Institute in Washington DC (July 23-2010). 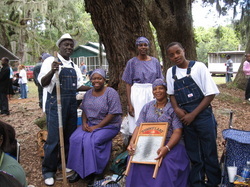 We the Geechee Gullah Ring Shouters of Georgia thank you for looking at our website. USA. This was at the Smithsonian Anacostia Museum in Washington DC. with Dr. Robert Stephens And Dr. Mary Ellen Junda at the College Music Society Conference. well for the next generation, and as they say the rest is history!! !